There's a recurring pattern that exists in the world of getting organized. First-time organization-seekers may think that this phenomenon only happens to them and it can be quite discouraging. However, it's more common that one may think and I argue that the pattern occurs every time someone is conquering an organizing task. I call this - The Organizing Curve. Let me explain and please refer to the graph that I created after hours of field work and experience. Humdeedumdum you're existing in your living space and are slowly realizing that your attempts at organization are failing. Maybe the wrong system is in place. Maybe you've been feeling sick and got lazy over the last week. Whatever it is, you suddenly realize that you're taking a quick downhill ride into the land of disorganization. 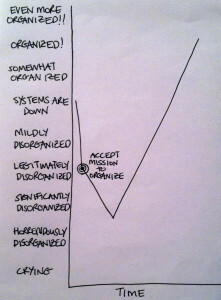 You're falling from "mildly disorganized" to "legitimately disorganized" (or "legit disorganized," as I like to call it). At the rate you're going, you know you'll reach "horrendously organized" in a day or two and may be crying a few days after that. So you take a deep breath, acknowledge that you need help, and accept the mission to get organized. You quickly read some tips (provided by the one and only) and get going. You know your goals, you know what needs to be done and you know you will get there. But then...BAM! You look around and you realize that you're approaching a "horrendously disorganized" state. Suddenly air is having a harder time filling your lungs, your heart rate begins to increase and a bead of sweat forms on your brow. HERE'S WHERE YOU MUST REALIZE THAT YOU'RE NOT ALONE! You've reached the peak of the graph and things are about to turn! KEEEEEEEP going!!! If you are working to get a space organized, there will most definitely be a point where it feels like you are creating more of a mess. But this is part of the process and need not daunt you. If you keep working through, things will quickly take a turn and you will climb the ladder to "mildly disorganized," "somewhat organized," and then "organized!" The most important things to remember are to keep your goals in mind, remain confident with that "I gotchyoo" attitude and to stay happy. You'll get there and when you do, you'll feel amazing and will forever be climbing. Because after all, you can be "even more organized!!"